Then, turn on your VGA device and set it to 640×480. Some RGB monitors accept higher resolutions, but just start with that for now. When a 640×480 VGA device is passed through the Super Emotia, the signal is being converted to interlaced, making it 480i RGB. If you set the front switch to “Non-interlace”, it will convert the signal from 480i to 240p (320×240 progressive scan). Most of the time, this may actually look much better. This is especially true if you’re making a Mame arcade machine, or playing emulators for older systems who’s native resolution is 240p. For more information, please check out my 240p page! The only versions of the Emotia to feature 240p output are the Extron Emotia, the Emotia Plus, the Super Emotia and the Super Emotia GX. Other models like the Super Emotia II or Emotia Xtreme have dropped their 240p capability. You can use an Extron Rxi to help fine-tune the image, as well as add a few other options. Fudoh expains in detail why you’d benefit from this in the link above. Also, please check out the Extron Rxi page for more info. 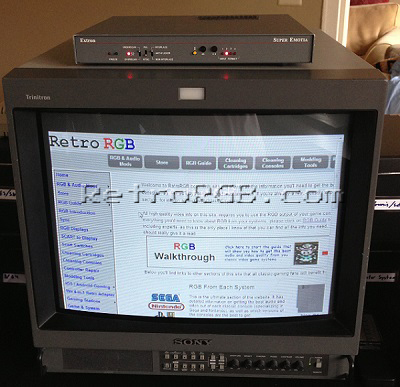 Feel free to go back to the main VGA to RGB Monitor page, or even check out the page that talks about getting a special video card that outputs RGB. If you’re done, I highly recommend you check out the other great guides listed on the main page…especially the RGB Guide!